San Diego New Music will present “Disparate Voices,” a concert exploring the sound poetry of modern musical masters at the Athenaeum in La Jolla on Nov. 14. 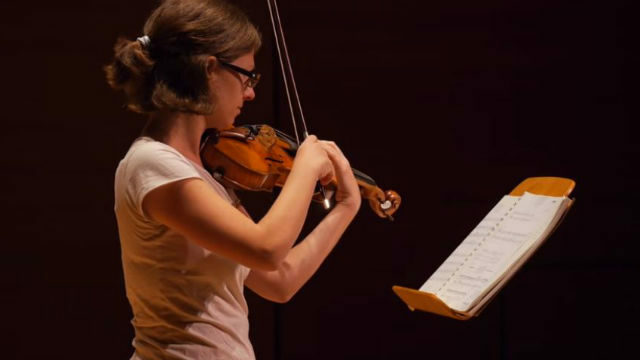 Violinist Batya MacAdam-Somer and soprano Bonnie Lander will explore the concepts of story and self through Scelsi’s surrealistic music, Schwitters’ Dada-inspired sound poetry, Kurtág‘s portrait of author Franz Kafka through a kaleidoscopic set of miniatures, and Chen’s quirky, intimate settings of different texts for singing and speaking violinist. The concert begins at 7:30 p.m. on Wednesday, Nov. 14. Tickets are available online at $20 for members, $25 for nonmembers and $10 for students. San Diego New Music is a nonprofit organization dedicated to the public performance of notable works from the 20th and 21st centuries.